Elvis Portrait Auctioned - Misc. Rolf Harris's portrait of the Queen attracted critics, and now his portrait of the King has attracted cash. His 2002 work, Blue Elvis, a portrait of Elvis Presley, sold at auction in London on Wednesday night for STG51,000 ($A122,700). Harris had given the work to his friend Shining Bear, who regularly plays the didgeridoo when the painter and entertainer performs. Harris gave his blessing when Shining Bear said he wanted to sell the painting to raise funds for his planned stageshow, The Gospel According to Elvis. hi oldie~56, if you put rolf harris in your search bar and go to rolf harris biography it tells you what he uses in is paintings, there are some fantastic paintings he has done including a self portrait. hope this was helpful. Opinion: This artist is absolute talent with a brush! Question: I just 'have' to know this! Who can help? Is the painting, 'watercolor', oil or acryllic? Not only is the man a musician but a genuine artist! This is no beginner's work and I'm saying that not because is it a flawless image of Elvis! When creative people pour out their souls, watch out world! 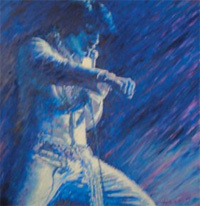 i think this is a fantastic portraitof elvis, i wouldnt sell this its the best one i have ever seen.